We are so thrilled to learn you will be attending TEDxDhaka 2014 on November 22nd at the KIB Complex! To ensure an engaging, peacefully mellow and thrilling experience at the conference we want to make sure you know all the key information about the event and your attendance beforehand. 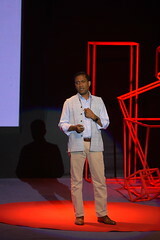 Comfort and informality help define the TEDx experience. The dress is casual for the whole event. Think “creative casual” more than “business casual.” For men, this means no ties, no suits or blazers. Then again, you probably don’t want to wear shorts either! Women tend to interpret “casual” more broadly, but please avoid suits and other classic business attire. Regional, ethnic and traditional clothings are cool! The weather forecast says the temperature will remain between 18°C to 28°C and there’s almost no chance of rain. The evening may be a bit chilly. We may need to check your identity at the registration desk or during the first entry. Please keep any kind of photo identity document (national ID card/ passport/ drivers license/ University ID/ Office ID etc.) with you to prove that you are indeed who you say you are. Business cards! You may regret not bringing enough of them, as you are going to meet a lot of people. You can bring your mobile phones, camera, laptop and other gadgets as long as they do not disturb others. Our schedule is so crammed, we don’t have time for long speaker introductions. 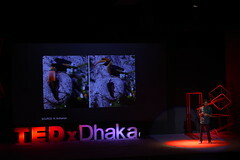 You can cehck out the introductions here http://bit.ly/TEDxDhakaBB. Google their names, do your homework and arrive ready to dive deeper. We strongly encourage you to arrive at the venue at 09:00. And get your on-site registration done by collecting your name badge (this may take some time). If you have extra time before the conference starts, you know what TEDsters do… talk to strangers! 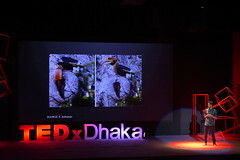 TEDx is an unusual conference in that our attendees stay for its entirety. Watch every talk. 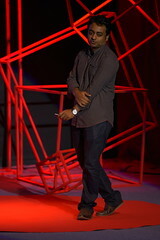 The best TEDx moments happen when you least expect them. It’s invariably the unknown speakers who wow the crowd. Watching every session helps avoid disappointment, and ensures you take in each key moment as it happens. Plan to stay with us until the evening (around 18:30). Where is the detail program lineup? We do not reveal the detail program until you arrive at the venue 🙂 It is best if you plan for the whole day and don’t miss a thing. 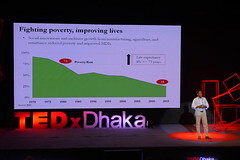 Please visit http://tedxdhaka.com.bd/venue to see the location, Google Map:https://goo.gl/maps/huDuW. If you have any confusion please write to us. The Krishibid Institution Complex is centrally located on the Khamar Bari road, it’s the new building there opposite to Islamia Eye Hospital. From any point of Dhaka you can take a bus to Farmgate and walk from there. To ensure a smooth registration, please remember to bring your attendee ID number with you to get your badge through express registration desks. If you do not know attendee ID please head to the information desks. Doing this allows us to ensure a smooth experience for everyone. 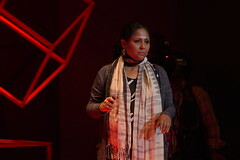 At TEDx events audiences are often equally extraordinary as the speakers. The person sitting next to you may be someone very interesting. Feel free to introduce yourself, share your ideas and look forward to a great conversation. Chance encounters at TEDx often lead to new ideas, projects, perspectives, and even companies … They’re as essential to the experience as the stage program itself. Break away from your ‘comfortable group’, you have the whole year left to spend time with your friends, today you should talk to strangers! Try to talk to as many people as possible! However, please respect others’ time and their wish to talk to other people. Requesting someone to take a photo with or asking for autographs is not very cool at TEDx, but if you must, do it discretely and with a single polite request, drop it immediately if they seem to be uncomfortable. Also if someone is not comfortable about their photos being published, please respect their privacy. There should be enough food and drinks during lunch and snack breaks. All food and drinks at the venue will be served free of cost. There will be 2 snack breaks and one lunch break between four sessions. It is very easy to forget to eat as you are likely to keep talking to people and as hundreds of new thoughts start playing in your head. It is, however, very important that you keep your stomach full and drink plenty of water to compensate for the intensity. And if you are a coffee lover, George’s Cafe will serve North End coffee at the venue along with cupcakes during snack breaks. There should be enough options for you to choose from. 1. Wear your name badge at all times once you get it from the registration desk. Your entry and movement at the venue will be restricted if your badge is not visible, missing or lost. 2. Video/audio recording inside the hall is strictly prohibited. Any person found recording video or audio will be stopped by volunteers and may be asked to leave the conference. 3. You can take photos inside the hall, but NO flash please. 4. You can bring mobile phones, tablets or laptops but you can not use them inside the hall except in the last row or outside the hall. 5. There will be a simulcast lounge showing the talks live right outside the main hall, you may sit there stretching your leg, open your laptop or cell phone to tweet/blog comfortably while watching the talks live. 6. Reminder just to keep you aware: You will be in photos/videos and we may post any of those photos/videos in public domain in the future. As an attendee you give us permission to publish your photos/videos from the event in the Internet or other media by default. However, you may request to remove any of your photos from the internet, and we will try our best to respect your privacy. Find the Volunteers! 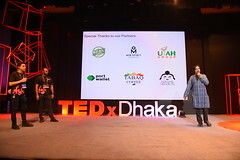 There will be an army of TEDxDhaka volunteers inTEDxDhaka t-shirts with purple badges at the venue to assist you for anything you need, and also may warn/remind(!) 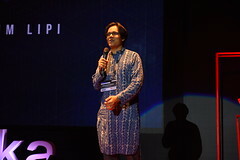 you about TEDxDhaka guidelines. Please cooperate with them, for example, if they whisper in your ear to request you to shut down your phone, maintain a queue or look for your badge at the gates. Also feel free to ask for their help for anything you need on site. Blog/Tweet/Facebook/Flickr with us… or not! 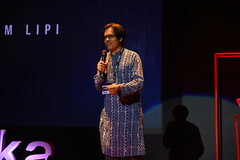 However, please do not feel obligated to live-blog or lifecast from TEDxDhaka, as TEDx is best experienced in the moment with full concentration. 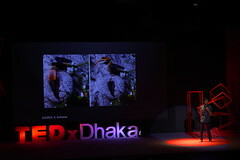 Please tag your photos with ‘TEDxDhaka’ if you upload them on Flickr and/or Instagram. 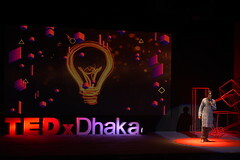 If there’s any query you have that we haven’t addressed… Feel free to write to us (email xteam@tedxdhaka.com.bd)! We look forward to welcoming you at the venue!